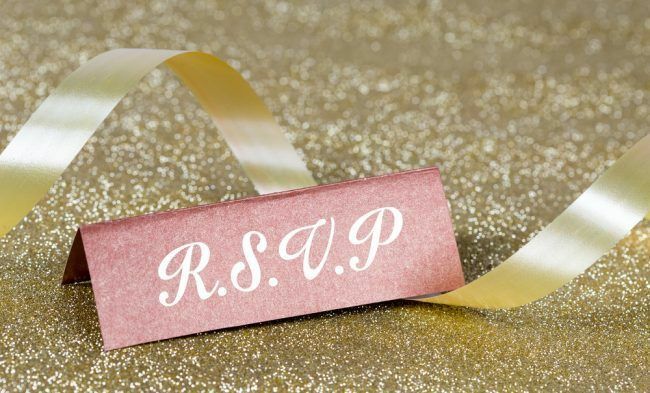 Let’s face it, there’s nothing more annoying than having to hound your guests to submit their RSVP cards (except maybe having someone show up who never bothered to RSVP at all). But in our internet-obsessed age, sometimes it can be difficult to get people to take their RSVP card to a mailbox. To make the wedding RSVP process more fun for everyone involved, try spicing up the reply card with options that will make guests laugh and encourage them to respond! There’s nothing worse than being at a wedding where they don’t play a single song you want to hear. Rectify this situation and make your guests a part of your special day by including a song request card on the RSVP. This way you’ll not only get the responses you need but have a built-in playlist to hand to your DJ that is sure to please the entire crowd. If an open bar is outside your budget, consider taking a survey of your guests’ drink requests on their RSVP card. Options might include wine, beer, champagne, and a signature cocktail. Ask them, of the options available, which they think they might be most likely to drink. That way, you can buy according to the responses and avoid any guests running out of their drink of choice. Of course, no one should actually threaten their guests, but a cheeky reminder that you need a timely response can’t hurt. Include a joke at the bottom of your RSVP card like “Reply by June 1st or we will put the bar tab in your name” or “Kindly Respond by April 15th or eat at McDonald’s prior to attending.” This way your guests will get a good laugh, but they’ll also have a funny reminder of how important it is that you hear back from them on time. 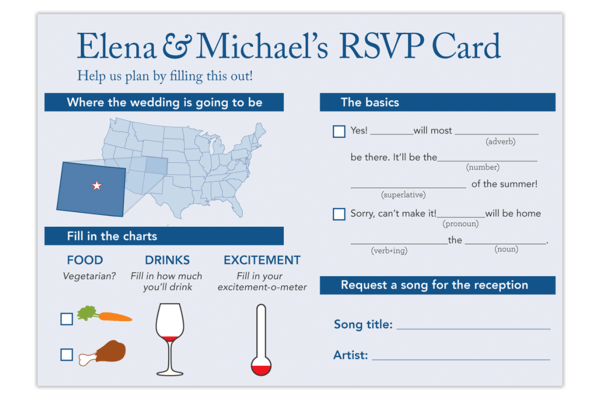 Give your guests a fun card to fill out, using icons for your food, the amount they expect to drink, or their level of excitement. Encourage guests to put their adult-coloring book skills to good use and decorate the RSVP card with options that require them to color in their responses. Who knows, maybe you’ll end up with a really memorable work of art. Remember the game of mad-libs– a short story where you fill in adjectives, nouns, verbs, and more, leading to a hilarious, nonsensical tale? Invite your guests to play this game on their response card. For example, “On October 8th, when they (verb) down the (noun), I/we (will/won’t) be there to (verb).” Not only will guests be excited to play, but you’ll end up with a hilarious litany of responses while working on the headache of your seating chart that will keep you entertained through one of the most trying parts of wedding planning. If you get any creative responses, you could even consider having a time during the reception to read them off and give everyone a good laugh. The average wedding has its share of dining options: chicken, fish, beef, vegetarian. But new spikes in food allergies and trendy diets like paleo have made dealing with dietary restrictions at a wedding a bit of a nightmare. If you have friends who seem to have a new allergy on a weekly basis or you just feel like being a troll, consider a response card with meal options designed to shame the person who can’t decide if it’s trendy to be allergic to gluten at the moment or not. Include legitimate options, but then also list responses like “I have so many food allergies I really should bring my own meal and not expect to be accommodated at a mass-catered event,” and so forth. Everyone knows weddings have reached an exorbitant price point these days with Americans spending five times as much on their big day as the rest of the world. So, why not soften the blow with a response card that pokes fun at the high sticker price. Much like a charity event, create a response card with Gift $ amounts that reflect the level of meal they can receive in return with chicken being the cheap option and lobster/swordfish on the top level, as well as a souvenir champagne glass for the big spenders. Make sure your guests have a good sense of humor before sending this along though! Grandma Betty might not get the joke and feel offended that you are asking for donations. Guests will be more excited about responding when your response card reflects your personality and sense of humor! Now, you can focus on the real planning of your wedding like finding your photographer, designing your theme, and more.